For contemporary styles, see Pantyhose and Hosiery. Hose are any of various styles of men's clothing for the legs and lower body, worn from the Middle Ages through the 17th century, when the term fell out of use in favor of breeches and stockings. (See also trousers.) The old plural form of "hose" was hosen. The French equivalent was chausses. 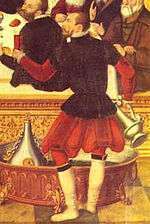 Early wool hose were fitted to the leg, and 15th century hose were often made particolored or mi-parti, having each leg a different color, or even one leg made of two colors. These early hose were footed, in the manner of modern tights, and were open from the crotch to the leg. 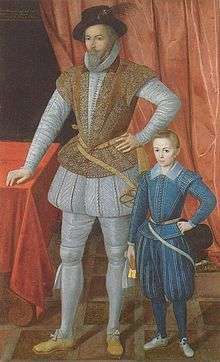 When very short doublets were in fashion, codpieces were added to cover the front opening. By the 16th century, hose had separated into two garments: upper hose or breeches and nether hose or stockings. 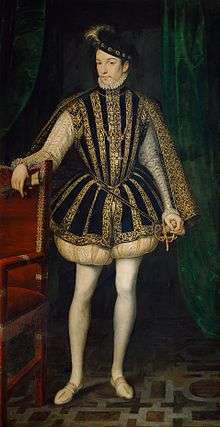 Trunk hose or round hose, short padded hose. Very short trunk hose were worn over cannions, fitted hose that ended above the knee. Slops or galligaskins, loose hose reaching just below the knee. Trunk hose and slops could be paned or pansied, with strips of fabric (panes) over a full inner layer or lining. Pansied slop is a round hose characterized by the addition of a layer of panes, or strips of fabric running from the waistband to the leg band. These are commonly referred to as "pumpkin" pants. Pluderhosen, a Northern European form of pansied slops with a very full inner layer pulled out between the panes and hanging below the knee. Originating in Germany, Pluderhosen soon spread to central and Eastern Europe. Venetians, semi-fitted hose reaching just below the knee. ↑ Arnold (1986), pp. 16–18. ↑ Kopalinski, Wladyslaw. "Słownik". Slownik-online. Retrieved 28 May 2015.